Mulan is going to make a man out of Yoson An. As announced by The Hollywood Reporter, Disney has cast newcomer Yoson An in the impending live-action Mulan remake. An, a New Zealand-born Chinese actor on the rise, is set to play Chen Honghui, an important ally and later love interest of Hua Mulan, played by Liu Yifei (also known as Crystal Liu). Chen Honghui is described as a "confident and ambitious recruit" who joins Commander Tung's unit, but he isn't to be mistaken for the beloved character Li Shang from the 1998 animated Mulan movie. Like Honghui, Shang was an army captain and Mulan's main love interest. The House of Mouse has stuck to its guns in putting together a primarily Chinese cast for its new Mulan film, which already has Jet Li on board as the emperor of China, Gong Li attached as a "powerful witch" (replacing the Hun leader Shan Yu, who was the original film's primary antagonist), and Donnie Yen set to play Commander Tung, Mulan's mentor. Despite An's casting further proving that Disney is making good on its big plans, however, there has been some major backlash over the character he plays. When word got out that the live-action Mulan wouldn't include Li Shang, instead opting for the new guy Honghui, fans were none too pleased, as many have theorized Shang is actually bisexual due to his bond with Mulan's male counterpart "Ping" that blossomed into an official relationship when Mulan revealed herself as a woman near the end of the movie. Fans hoped the live-action film would include Shang's character, and possibly even explore his sexuality further. Sadly, Shang is M.I.A., and it doesn't seem that Honghui will be anything like Shang. A previously released casting call for the character noted that Honghui is determined to become "the best soldier in human history," and starts a rivalry with Mulan when she's disguised as a man. It's only after Honghui discovers that Mulan is really a woman that he feels a connection to her; his "intense feelings of rivalry turn into something very different, something like love" following the revelation. Pretty dang different from the kind but strong Shang, huh? 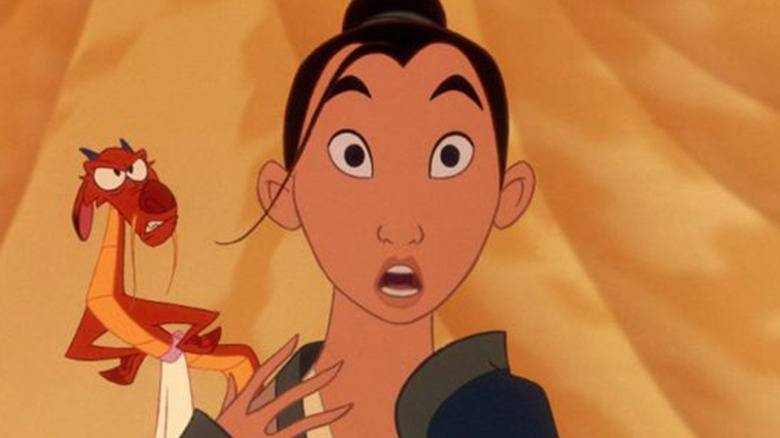 In response to the news, one Twitter user wrote that she was "disgusted" that Disney would remove "any possibility that Chen is seen as bisexual," and couldn't believe the film will seemingly depict him hating Mulan when she's presenting as a male and bullying her "up until he finds out she's a woman." Hopefully Chen Honghui isn't as bad as the casting call notes make him out to be, and that Yoson An will shine in the role that could be his major break following his parts in The Meg and Mortal Engines. Directed by Niki Caro, Mulan is set for a March 27, 2020 debut.